The best day in a parent’s life turns into the worst.For expectant parents, the origins of a new life are usually accompanied by excitement, anticipation and just a touch of anxiety about the future. There are classes to attend, prams to buy, and of course, the baby’s room has to be painted. This description fits Gary and Melinda quite nicely – except Gary hasn’t painted the baby’s room yet. He finally gets around to starting the job, but Melinda’s water breaks before he finishes the first coat. From there, the situation rapidly deteriorates. Their baby, Justin, is born via caesarean. Shortly after the birth Justin experiences breathing difficulties and is transferred to intensive care a few hours later. The story follows Gary over a tumultuous few days as Justin undergoes emergency treatment. 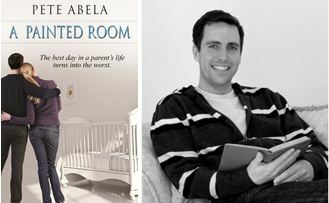 Gary and Melinda quickly discover that when a baby’s life is on the line, it doesn’t really matter whether or not you have a painted room. Pete heralds from the city of Wollongong, just south of Sydney in the state of New South Wales, Australia, where he lives with his wife and four kids. His love of reading eventually led him to take up writing, a difficult task which presents rewards and challenges in equal measure. A Painted Room is Pete’s second book, and follows his debut novel, Wings (2012). When he’s not working, reading, writing or enjoying the company of his family, Pete likes to sneak away for a bit of exercise – either tennis, golf or a refreshing swim. You can find more about Pete at his website and blog (http://peteabela.com). The blog contains a number of bad jokes and puns. You have been warned. Melinda waddled into the bedroom, looked at the display on the luminous alarm clock and frowned. Shaking her head, she trudged across the room and pulled herself slowly onto the bed, wincing as her back registered its habitual protest. She looked down at her body, an expression of displeasure crossing her pretty face. A couple of varicose veins featured prominently on her once smooth and unblemished legs. She removed the chain from around her neck and unthreaded the wedding band. Holding the ring in one hand, she tried to place it on her swollen ring finger first then her pinkie, but could not get past the first knuckle with either of them. Shaking her head, she replaced the ring on the chain. Her pajama top stretched tightly over her eight-month belly. She tried to pull the top down to cover the exposed band of skin at the bottom of her tummy, and snorted in disgust when it sprang back, once again revealing her stretch marks. Melinda picked up a piece of paper from the bedside table and examined it closely. It did not give her any more joy than the sight of her pregnant body had. In fact, she scowled as she perused the paper. It was a list of jobs. A long list of jobs and only a few of them had been crossed out. The spare bedroom still needed to be cleaned out and painted. The cot required assembly and the plastic bags full of nappies, bibs, clothes and toys still remained unsorted. A leather bound diary lay on the bed. Melinda turned to the yearly planner page and placed her finger on a prominently circled date. She counted backwards, a week at a time on her fingers, stopping at four. She looked from the list to her fingers and back again with pursed lips. Reaching across to the alarm clock, she fiddled with the settings. The jangle of keys at the front door interrupted her. She looked up expectantly, and then composed her features to remove any trace of welcome. The keys were dropped, and a male voice swore. The jangling resumed and the front door opened. Melinda sat back on the bed with her arms crossed and looked down at her watch. “It’s about time,” she greeted him icily. “Hello to you too,” replied Gary. He fumbled and bashed the alarm clock which had jolted him out of an unsettled sleep. He half-opened one eye. The luminescent dials glowed brightly, searing into his glassy eyeball like a hot poker. His befuddled brain struggled to make sense of his surroundings. Was it Monday already? Surely not. It must be Sunday. But what could cause the alarm to go off at quarter to six? “Hold on a minute. Take it back to the start,” commanded Gary. “Are you trying to tell me that you’ve woken me up at sparrow’s fart on a Sunday morning so I can empty the spare bedroom? You must be crazy. I’m going back to sleep.” He rolled over, pulling the pillow over his head and digging into the quilt. However, his pounding head and cardboard tongue prevented him from relaxing. Another bout of beeping broke out, this time from across the room. Gary groaned. “I can see I’m not going to get any more sleep this morning,” he grumbled as he stumbled out of bed. “By the look of you, it might actually do that,” laughed Melinda. Gary looked at the results of his work with pride. Despite feeling sore and lethargic, he had worked diligently and made large inroads into his task of cleaning the spare room in preparation for painting. Most of the cleared debris stemmed from the numerous holidays taken over their nine years together. A pile of suitcases, photo albums and souvenirs from all corners of the globe stood in a neat pile in the hallway, ready to be placed in the attic. Gary stood, wiping his mouth. “I’m sure we’ll be able to cope,” he said as he turned and walked back to the bedroom. Melinda smiled at Gary. A surge of affection rose unbidden within her. Gary looked like a big kid, dressed in his daggiest tracksuit pants and a faded Billy Joel t-shirt. Blobs of paint were in evidence everywhere – on his shirt, on his pants and even one large smear across his left cheek. His thinning black hair was dishevelled and his paint-smudged face managed to simultaneously convey expressions of impish mischievousness and gentle concern. Melinda sank into the large, padded armchair purchased for night feeds. She rested her feet on a convenient paint tin and eased her neck and head into the back of the chair. The long, slow strokes of the roller travelling up and down the wall possessed a strangely hypnotic quality. She sat in silence, her eyes following the roller’s progress as it transformed the wall from a dull peach to a light and airy green. “You look like you’re falling asleep,” observed Gary. Melinda paused mid-sentence. She touched her thighs with her hands and sat up straight in her chair. She looked down at the ground.